The first novel of the Fallen Empire series is fascinating! Grace Draven's storytelling is intoxicating and compelling. The characters have depth that pulls you in with the need to see what motivates them or pushes them to make grave sacrifices. 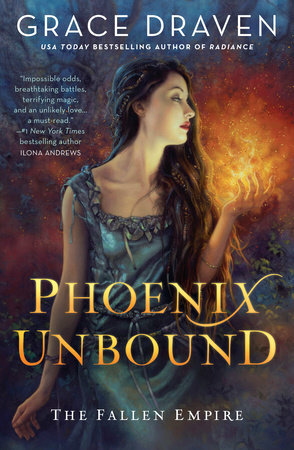 Phoenix Unbound is one of those stories that slowly builds up to something completely epic and memorable. Gilene turned out to be such a beautiful character. She was a bit standoffish and aggressive in the beginning, but once removed from the oppressive duties of her hometown she flourished. Azarion escaped from the clutches of the Empire with Gilene's help, but it takes all of his own strength to reclaim his leadership role in his clan. I actually like that their relationship isn't rainbows and sunshine from the start. It makes seeing its development from hostile to friendly more substantial and believable. The threat of the empire hangs over their shoulders throughout the novel, but its infamous leaders don't get much page time. It was easy to forget the threat unless you paid attention to the state of the common people Gilene and Azarion came across between their escape and journey to Azarion's birth home. The ruler's greed and injustices keep the characters pushing towards their goals and make readers wonder how they're going to stand up to their oppressors. I'm so eager to see the rest of the world created in Phoenix Unbound unfold in the series. It's been a while since I've read a fantasy novel like this and I want to soak it up! This is the novel to read if you're a fan of Sandy Williams or Ilona Andrews!